Volkswagen has released all of the official details of the 2015 VW e-Golf ahead of its debut next week at the LA Auto Show. The zero-emission version of the next-gen Golf, which we saw for the first time at Frankfurt, will go on sale in the US during the fourth quarter of next year. In place of the new Golf's gas and diesel engines, the 2015 e-Golf gets an electric motor whirring out 115 horsepower and 199 pound-feet of torque. Juice comes from a 24.2-kWh liquid-cooled lithium-ion battery pack. These figures (especially torque) are far less than that of the Spark EV (140 hp and 400 lb-ft), so we don't expect it to be as fun in the stoplight-to-stoplight drag, which is backed up by the 0-60 time of 10.4 seconds. There are two driving modes (Eco and Eco+) as well as driver-selectable brake regeneration modes for one-pedal driving. VW pegs the driving range at between 70 and 90 miles. VW says the e-Golf can be fully recharged in four hours using a dedicated 220-volt wallbox in a garage or carport, while a standard household plug (110 volts) will take about 20 hours; a DC fast-charge option is also available giving the car an 80 percent charge in about 30 minutes. The e-Golf is easily noticeable from its exterior styling with a unique grille and front fascia, aero-optimized wheels and LED headlights. The cabin also gets a few changes that include a new instrument cluster layout with a touchscreen display that shows a range monitor, energy flow indicator and an e-manager that allows the driver to set future departure times to ensure proper charge. But just in case the battery is depleted, VW still has its customers covered with a unique roadside assistance service. If a customer runs the e-Golf out of power within 100 miles of their home, VW will have the vehicle towed to a nearby charging source at no cost and will even pay for a taxi for the customer, if desired. Pricing for the e-Golf has yet to be announced, but sales will be limited to "participating dealers in select states." Scroll down for the full press release on the car, click above to enlarge the single image released so far and stay tuned for more information and live images next week. Los Angeles - Volkswagen of America, Inc. today announced details of the e-Golf, its first fully electric vehicle to go on sale in the U.S., which will debut at the Los Angeles Auto Show. The e-Golf is part of a structured powertrain strategy that will lead to the timely introduction of new and alternative drive systems, and is a part of Volkswagen's holistic approach to sustainability, Think Blue. Volkswagen has stated that it aims to be the world leader in e-mobility among automakers by 2018. Although Volkswagen has sold more than 30 million Golf models worldwide, this is the first zero tailpipe emissions, fully electric version of the car that will be sold to the public. The e-Golf is available in five-door form only and is immediately recognizable by its unique aluminum-alloy wheels and by its LED headlights, the first time they have been used as standard on a Volkswagen vehicle. The LED headlights are more energy-efficient than Bi-Xenon systems, yet produce even more light. The standard LED daytime running lights are also highly energy-efficient and have a signature C-shaped design, a feature of Volkswagen's electric vehicles. Another striking feature is the colored strip across the radiator grille that consciously aligns the e-Golf with Volkswagen's Think Blue® sustainability campaign. The e-Golf is powered by a 115-horsepower electric motor. From a standing start the EEM-85 synchronous permanent-magnet AC motor develops an impressive 199 pound-feet of torque, allowing the e-Golf to reach 25 mph from rest in 4.2 seconds and to get to 60 mph in approximately 10.4 seconds. Top speed is electronically limited to 87 mph. The high-performance 12,000-rpm motor and the single-speed EQ270 transmission form a compact unit: the EQ270 also incorporates an integrated differential and an electro-mechanical parking brake. The motor and transmission was developed in-house and is made at Volkswagen's components plant in Kassel, Germany. Depending on driving style and charging behavior, the average range for the e-Golf is between 70 and 90 miles. Helping ensure optimal range in cold weather is a newly developed heat pump that is part of the e-Golf's comprehensive list of standard equipment. The pump uses both ambient air and heat from the drive system components to heat the cabin rather than relying solely on the high-voltage heater, helping to reduce on-board electrical consumption significantly, especially in winter driving. Lithium-ion battery. The Golf A7 was developed from the outset to be a Battery Electric Vehicle. As the Modular Transverse Matrix (MQB) architecture that underpins the new Golf A7 is so flexible, Volkswagen was able to integrate the lithium-ion battery in a space-saving frame in the vehicle floor, under the front and rear seats and in the center tunnel. 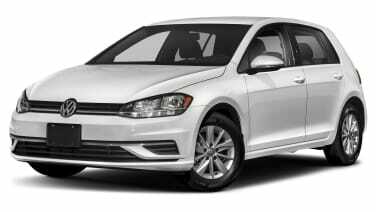 Like the electric motor and the transmission, the battery was also developed in-house at Volkswagen and is made at the company's facility in Braunschweig, Germany. The liquid-cooled lithium-ion battery accounts for 701 pounds of the e-Golf model's 3090-pound curb weight. It is composed of a total of 264 individual prismatic cells, which are integrated into 27 modules (each with six or twelve cells). Collectively, the cells have a nominal rating of 323 volts, with an overall capacity of 24.2 kWh. A battery management controller (BMC) performs diagnosis and monitoring functions and also regulates the temperature balance in the battery junction controller (the interface to the motor's energy supply). When the car is not in use or in the event of a collision, power from the battery is automatically cut off. There are several different ways of charging the e-Golf's battery, via the car's standard 7.2 kW onboard charger. The most optimal solution is the available 220-volt wallbox for a garage or carport: this charges at 7.2 kW, enabling a completely flat battery to be fully charged in less than four hours. If a 220-volt connection is not available, the most cost-effective and easiest alternative is to plug the standard charging cable into a 110/120-volt electrical socket, which will take around 20 hours to charge the battery. The standard Combined Charging System (CCS) plug gives the e-Golf the capability to also take advantage of DC Fast Charging infrastructure. In this case the car can be recharged at CCS-equipped DC fast charge stations at levels of up to 40 kW, allowing the battery to be charged to 80 percent in around 30 minutes. For added flexibility, the charging process can be activated-immediately or programmed for later-by pressing a button next to the charging socket under the 'fuel cap' or through an available iPhone® or Android® app. The e-Golf features two technologies that allow the driver to control the vehicle's energy use: three driving profiles designed to preserve energy ('Normal', 'Eco', and 'Eco+'); and three different levels of regenerative braking ('D1', 'D2', and 'D3'/'B'). 'Eco' and 'Eco+' driving profiles. The e-Golf has three driving profiles: 'Normal', 'Eco' and 'Eco+'. The car automatically defaults to 'Normal' mode upon start up. To extend the range, the first option is the 'Eco' mode, which pares back the electric motor's maximum power output to 94 hp and the starting torque to 162 lb-ft. In parallel, the electronics reduce the output of the air conditioning system and modify the response curve of the accelerator pedal. In Eco mode, the e-Golf is limited to a top speed of 72 mph and 0 to 62 mph acceleration is increased to 13.1 seconds. In 'Eco+' mode, the electronics limit the power output to 74 hp and the starting torque to 129 lb-ft, further flatten the accelerator pedal response curve and the air conditioning is switched off. The e-Golf now reaches a top speed of 56 mph and accelerates at a correspondingly slower rate. Nevertheless, full power, maximum torque, and the 87 mph top speed can be obtained if the driver depresses the accelerator pedal fully down in either 'Eco' or 'Eco+' mode. Regenerative braking settings. In addition to the driving modes, the regenerative braking system can also be used to manage range. There are three driver-selectable levels available: 'D1', D2', and 'D3'/'B'. It works like this: to switch to 'D1", 'D2", or 'D3", the driver taps the "shift" lever to the left once, twice, or three times. Tapping the knob to the right moves sequentially back to 'D'. If the lever is pushed to the right and briefly held there, the electronics switch straight back to 'D'. The driver activates regenerative braking level 'B', which is the same as 'D3', by pulling the lever backwards. In an electric car this amount of flexibility can lead to a different way of driving. It is possible to use regenerative braking consciously to slow the e-Golf down. Level 'D1' regenerates energy and slows down the car the least, while level 'B' has the strongest effect. At levels 'D2', 'D3' and 'B', the deceleration via regenerative braking is so strong that the brake lights come on automatically. However, if the battery is fully charged, no energy regeneration takes place. Volkswagen took very specific measures to lower the e-Golf model's coefficient of drag (Cd). Among these were: reducing the volume of cooling air via a radiator shutter and partially enclosed radiator grille; new underbody paneling; a rear spoiler and C-pillar air vanes to better manage airflow at the tail of the car; and cleaning up the airflow around the wheels, largely by ensuring they are flush with the wheelarches. Volkswagen specifically tailored the acoustics of the e-Golf for an electric vehicle, making it an almost silent cruiser. For instance, the powerplant's subframe was changed to a pendulum mount: despite the electric motor's high torque build-up when accelerating, this greatly enhances the acoustics. The motor housing unit was also specifically designed to achieve an extremely low level of noise emission. Finally, the interior uses highly sound-absorbent and yet very lightweight materials to produce a vehicle that is quieter than many luxury cars. In addition, the e-Golf has a new instrument layout. The tachometer, which normally lives on the left-hand-side of the instrument cluster, is replaced by the power display-which indicates if the motor is ready, the battery is being charged via regenerative braking, or power is being drawn off-and an indicator of available output. To its right, there is a conventional speedometer. The lower section of the speedometer now has an indicator showing the high-voltage battery's state of charge. The color display between the power gauge and the speedometer now indicates the driving range, the current level of regenerative braking, and the remaining charging time and the type of charging connection. In a separate LED field at the lower segment of the multifunction display, the 'READY' message also appears after starting the motor. -Range monitor: this provides a graphic illustration of the vehicle's current range. The impact that auxiliary components such as the air conditioning or heater would have on range is also displayed: the driver can gain additional range by switching these off. -Energy flow indicator: this depicts the energy flow when accelerating (blue arrows) and when regenerative braking is happening (green arrows). Regenerative braking statistics show the amount of energy recovered since the start of the journey. -e-manager: this enables drivers to pre-program up to three departure and charging times. At the defined time, this helps ensure that the vehicle has the air conditioning level set and the battery charged. The e-Golf features as standard a new assistance system called the Automatic Post-Collision Braking System. Studies in accident research have shown that about a quarter of accidents that involve personal injury are of the multi-collision type-in other words, there's a second impact after the initial collision. The driver can 'override' the system at any time; for example, if the system recognizes that the driver is accelerating, it gets disabled. The automatic system is also deactivated if the driver initiates hard braking at an even higher rate of deceleration. Volkswagen intends to make the e-Golf ownership experience as seamless as possible. This includes offering a Roadside Assistance Plan that's designed to take the anxiety out of "range anxiety". For instance, if the customer runs out of charge and is within 100 miles of their home, Volkswagen's Roadside Assistance provider will deliver the car to a nearby and convenient source for charging and will even pay for the customer to take a taxi home or to work if they decide not to travel with the car. The plan covers unlimited events. plus a display of the outside temperature and the target temperature for the car's interior. charger connection status, charge status, charge progress, charge level, charge start time and range. trips or long term), such as miles driven, journey time, electric motor power consumption, power consumption of auxiliary components such as air conditioning and radio, use of regenerative braking. -Vehicle status queries: Doors and trunk locked, lights (on/off), charging cable plugged in, position where the car was last parked (GPS position on a map). Founded in 1955, Volkswagen of America, Inc., an operating unit of Volkswagen Group of America, Inc. (VWoA) is headquartered in Herndon, Virginia. It is a subsidiary of Volkswagen AG, headquartered in Wolfsburg, Germany. VWoA's operations in the United States include research and development, parts and vehicle processing, parts distribution centers, sales, marketing and service offices, financial service centers, and its state-of-the-art manufacturing facility in Chattanooga, Tennessee. The Volkswagen Group is one of the world's largest producers of passenger cars and Europe's largest automaker. VWoA sells the Beetle, Beetle Convertible, Eos, Golf, GTI, Jetta, Jetta SportWagen, Passat, CC, Tiguan, and Touareg vehicles through approximately 630 independent U.S. dealers.